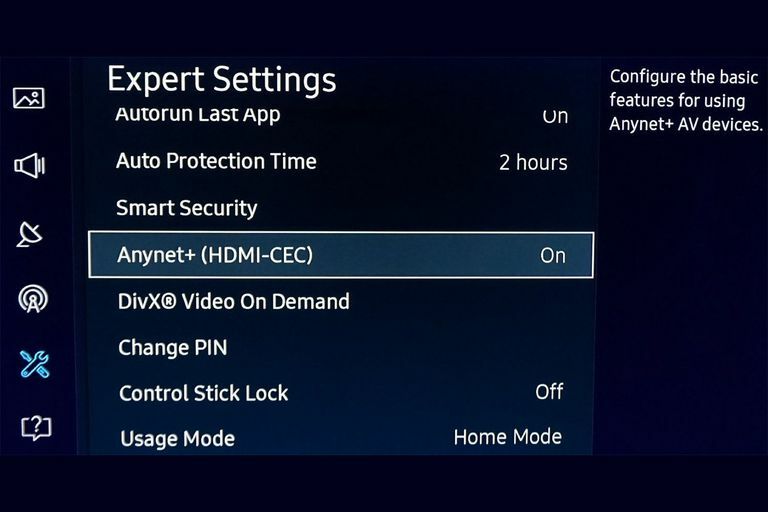 Samsung Anynet+ HDMI-CEC Setup Option in TV Menu screenshot. The "CEC" in HDMI-CEC stands for Consumer Electronics Control. It is an optional feature that allows control of multiple HDMI-connected devices from one remote (such as a TV remote). Love it or hate it, HDMI is the main connection standard used in the AV environment. However, in addition to connectivity and HDMI-ARC, HDMI-CEC is is another feature of HDMI that not many consumers know about. In fact, HDMI-CEC may already be enabled on a device you already own (or you may need to activate it via your TV or device settings menu). HDMI-CEC provides several capabilities, which are listed below. However, not all listed are accessible on all HDMI-CEC enabled products. Also, feature compatibility between product brands may vary. Remote Control Pass Through - Allows remote control commands to be passed through to other devices within a system. Example: You can use your TV remote to control some of the functions of other devices that are connected to your TV using HDMI. One Touch Play - When you start playback on your source device, it will switch the TV to the HDMI input that the device is connected to. Example: When you insert a disc into your Blu-ray Disc player, and press play, it can tell the TV to switch to the HDMI input that the player is connected to. Routing Control - Allows users to control input source selection. Example: Using a TV remote, you can switch the input selections on a connected home theater receiver. Deck Control - This allows users, via a TV remote, to control playback features, such as Play, Pause, Rewind, Fast Forward on a compatible HDMI-connected Blu-ray/Ultra HD Blu-ray disc player, media streamer, and/or cable/satellite box. One Touch Record - If you have an HDMI-CEC enabled DVR or DVD recorder, you can start the recording process when you see a program of interest on your TV screen. Timer Programming - You can use an electronic program guide (EPG) that may be included in your TV or cable/satellite box, to set the timer with compatible DVD Recorders or DVRs. System Audio Control - Allows users to control volume levels (or other compatible audio settings) of an HDMI-CEC equipped Home Theater receiver or AV preamp/processor using the TV remote. System Standby - This allows users to put several devices in standby mode using one remote control. Using your TV remote you can switch to each input that your source devices are connected to and toggle them in and out of standby mode as desired. One confusing thing about HDMI-CEC is that it isn't always obvious whether a device features it. To clear up this confusion the following is a list of how several TV and home theater component manufacturers label it. There are additional brands not listed, and labels may change over time. You can use your TV remote to control some features of devices that are connected to the TV using HDMI, which may lessen the need for a universal remote control. The same HDMI cables that connect your audio and video components together can be used as a conduit for controlling those devices. CEC functionality is not required to be included on all HDMI-equipped devices. On devices that include HDMI-CEC, feature access is not always consistent when using mixed brand components. Not as comprehensive control as using the device's own remote or a universal remote. In some cases, HDMI-CEC must be activated in order for HDMI-ARC to also work. Sometimes HDMI-CEC will activate or turn-off devices when you don't want it to. In addition to connectivity, HDMI-CEC allows some control of multiple devices without needing a universal remote or another control system. However, HDMI-CEC is not as comprehensive as many universal remote control systems as it can only be used with HDMI-connected devices, and there is some feature inconsistency between product brands. And, as noted, the feature can turn devices on/off unintentionally. On the other hand, you might find it more convenient than using remote control apps available for smartphones and tablets, but it is not as "glamorous" as the increasing popularity of the Alexa and Google Assistant control options that an increasing number of product brands are offering, which, in the near future, may end up superseding all current control options. That being said, if you have HDMI-connected devices in your home theater setup check for HDMI-CEC capability and see if any of its available control features work for you.